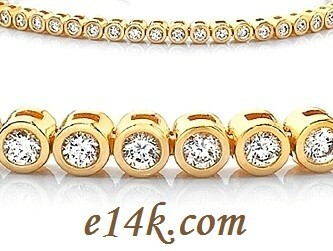 Solid 14k Yellow Gold Round Bezel Set Cubic Zirconia Tennis Bracelet... 14k Gold... 4mm Round Brilliant stones for a total of 8 carats! Gorgeous Russian CZs!!! Immaculate!!! Top Quality, Heavy Bracelet! Diamond Grade mounting! Secure double safety clasp. Our Russian CZs are more precisely cut & polished of the best CZ quality available, making them the most desirable CZ stones available. Item subject to availability. May take 4-6 weeks if not in stock.